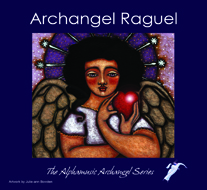 As the angel of diplomacy and negotiation, Raguel is ready to come into your life if you are in dispute; if you need resolution to any problems. Whether they be personal, professional or legal he will bring care, harmony, respect and fair resolution to all areas of your life. Raguel reputedly kept order amongst the angels, carrying this into the earthly dimension he will relieve tension, bring balance and allow new order to come into your life. Raguel will help you let go the arrogance of judgement and find strength in humility. He brings all elements to light so you can appreciate there is no right or wrong, just a difference of opinion.